Defence company Thales has announced 180 jobs are to be cut from the firm's Taunton base. Earlier this year the company announced it was considering moving some of the positions to Glasgow, while unions tried to negotiate fewer relocations. But on Thursday the company said that plan had not "worked out". The company, which makes sights and range-finding equipment for battle tanks, said in February it could no longer afford to keep its Taunton base. In a statement, the company said: "This proposal has been reached following a detailed review of our business activities and is despite significant efforts from all parties to make the business more competitive. "Sadly, we have been unable to make the Taunton business a viable proposition in either the medium or long-term. "As a consequence, it is proposed that all work be transferred to Thales' Optronics Business in Glasgow, creating a number of permanent and temporary employment opportunities for Taunton staff." 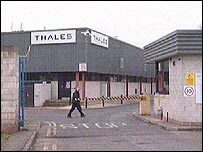 The Somerset town's Liberal Democrat MP Jeremy Browne said: "I was always concerned that maintaining some jobs at Thales would prove to be a stay of execution rather than a reprieve."